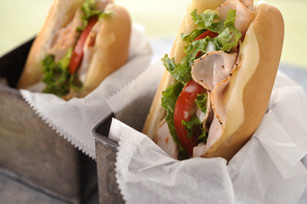 Treat yourself and a friend to this Tasty Toasted Turkey Sub for two—packed with flavor, it's perfect for sharing at any meal. Open buns; place, cut-sides up, on foil-covered baking sheet. Top with cheese, turkey and dressing. Broil, 6 inches from heat, 3 to 4 min. or until cheese is melted and sandwiches are heated through. Top with tomatoes and lettuce; fold in half. Prepare using KRAFT Slim Cut Sharp Cheddar Cheese Slices.